Eileen Nivera of the Maryland National Capital Park and Planning Commission (M-NCPPC) told me yesterday that she just heard from the project staff for the DC portion of the Anacostia River Trail. DDOT’s contractor is doing the design work for the trail from Benning Road to the existing trail in Prince Georges County, she said. Right now, the design work is 65% complete, which in this case means that the entire trail has been designed but a lot of work remains in obtaining the required permits. DDOT has also been awaiting completion of an Environmental Assessment by the National Park Service (Washcycle also made that point in the comments section of this week’s blog about the October 1 NOVEMBER 4 opening ceremony for the new section that follows the east side of the river from the Port of Bladensburg almost to the DC line). Finally, Amtrak has not yet agreed to allow the trail to pass under its bridge. All of this preparation will be done by the end of 2012, she said. Ms. Nivera did not know whether the construction would proceed from south to north, from north to south, or from both ends toward the middle. This final trail segment trail has not yet been funded. Ms. Nivera expects the District of Columbia to seek a federal grant for the remaining section. 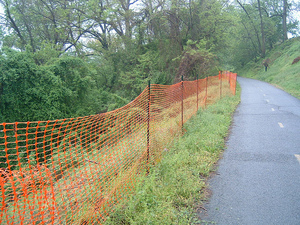 Because the new segment stops at the woods, a short segment of trail including a small bridge must still be built on property owned by M-NCPPC, as well as property owned by the National Park Service in Maryland along ‘the ramp from the Baltimore-Washington Parkway to westbound US-50. M-NCPPC has no plans to obtain funding for that segment, she said. 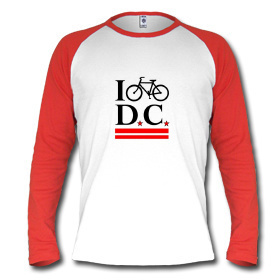 Instead, it will be part of DDOT's grant application. While it would be unusual for the District of Columbia to fund trail construction beyond its boundaries, it is not unusual for a government agency to manage a federally funded construction project that crosses into another jurisdiction. Thanks to calls from bicycle and pedestrian advocates like you, the Senate refused to hear an amendment that would have blocked any Economic Recovery Bill money from being spent on biking and walking infrastructure projects. Now we need EVERYONE’S HELP to make certain that there is strong support for Transportation Enhancements $ for biking and walking in the final bill! -Bicycle and pedestrian projects create jobs at the same or better rate than highway projects. -These smaller projects can move quickly to hire local businesses and help local economies. -Improving sidewalks and bike lanes can make a downtown a destination further helping the local economy. -Better biking and walking options also help ensure greater energy independence, less pollution, and a healthier United States! MoBike, together with WABA, CCT and Potomac Pedallers submitted a series of budget requests to the County Executive to be included in the Montgomery County 2009-2014 Capital Budget. The battle over what to do with the open space at Armed Forces Retirement Home (aka Old Soldier's Home) has taken an interesting turn. For background go here. A community non-profit has gotten into it and is proposing a new park - Washington Central Parks - on part of the space. The idea is to create three small parks: Fort Totten Park to the north, Old Soldiers’ Home Park in the middle and McMillan Park and Reservoir to the south and then thread them together with a linear park containing of a bicycle trail. A good solution for the Armed Forces Retirement Home, however, would require a sufficient sum of money, something Washington Central Parks cannot currently offer. “They haven’t come up with a way to pay for it,” said Chris Black, a consultant for the home. Black said that leasing portions of the campus is the only way the Armed Forces Retirement Home will be able to meet the needs of its veteran residents. The home planned originally to lease the land being eyed by Washington Central Parks to commercial developers, though Black said it would be willing to lease the land for use as a public park if the price were right. Washington Central Parks’s Anderson said the organization will be searching for funding in the coming months. An article in the Wall Street Journal talks about the recent expansion of urban parks and how they do (and don't) get funding. As cities increasingly rely on corporate donors, real-estate developers and private, not-for-profit entities for park funding, they're facing some criticism. When Chicago's Millennium Park, opened in 2004, named prominent areas after corporate sponsors such as SBC, Boeing and British Petroleum, some traditionalists cried foul. Several cities have recently devised guidelines for sponsorship and naming rights -- in Denver, a company has to contribute 50% of all capital costs to get its name or logo on a new park. The area around the retirement home has a dearth of park space because the open space at the home was counted as a Park when the McMillan Plan came out, so this idea has some merit beyond the addition of bike facilities. Chris black never states how much it will cost to get the park built, but I know where to get the first $5 million. Columbia Bike Path to cross "Berlin Wall"
Columbia, MD is trying to redevelop itself as an urban center. As part of that it plans to "upgrade a foot and bike path over Route 29 [to] better unify Eastern and Western Columbia in Howard County." “Route 29 is like the Berlin Wall between East and West Columbia,” said Phil Engelke, property and business chairman on the Oakland Mills Village Board. I'm trying to imagine Wings of Desire in Columbia, MD. It's not as good - even with Peter Falk. I wrote about how micro-trails can unite communities before and this sounds like the same kind of thing. The one-mile pedestrian corridor would become more inviting with the changes and link residents to Oakland Mills’ shops, restaurants and the future Bland Air Regional Park, the village board’s revitalization chairwoman Karen Gray said. The 10-minute walk is less of a hassle than driving and parking, said Council Member Calvin Ball, D-District 2, who represents the Oakland Mills Community. If it's a 10 minute walk - think how quick it would be on a bike. Ten for Tuesday - I'd rather get a lower price than free stuff. 1. The 11th Street Bridge EIS is still in it's public comment period. About 20 feet will be set aside for bikes/peds. Right now there's about 6 feet on the southbound side and 4 on the northbound (the north side involves carrying your bike up/down stairs). The new bridge plans include either a 14 ft northbound - 6 ft southbound mix or a 12ft/8ft mix. It seems that capacity increases immensely at 12 feet and drops at 10 feet. So why not add 2 feet for a 12ft/10ft mix? the Transportation and the Environment Committee of the Montgomery County Council will review the recommendations and give design guidance to the Department of Public Works and Transportation on their preferred option [for the Met Branch Trail]. WABA wants you to support Option 1. 3. 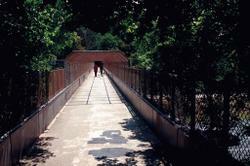 The Marvin Gaye Park Trail groundbreaking is this Saturday. For more information, please call Washington Parks and People at (202) 462-7275. 4. The 2006 Itz fair is this Thursday. Zipcar, North America’s largest Carsharing company is bringing together public and private transportation organizations from around Metro Washington D.C. for the second annual ITZ! Innovation In Transportation Fair on June 22nd from 3-8 PM on 8th St. between D and E Streets, NW. From the GM Hydrogen Fuel Cell vehicle to GEM electric cars to displays from local transportation leaders, the event will provide local businesses and residents with a fun and exciting opportunity to learn more about cost-effective, viable transportation alternatives, and experience first-hand the newest and most innovative ways to get around. Washington Area Bicycle Association (WABA) and Capitol Hill Bikes will have bikes at the event to promote bicycling as an alternative way to get around town. 5. Bush went on a bike ride with Danish Prime Minister Anders Fogh Rasmussen. And it was covered here too. 6. Bicycling magazine's website gets an upgrade, including a new Mountain Bike section. 7. Former Virginia Lt. Governor Don Beyer - now a car dealer - is offering a free bike, free dogwood tree and 2 tickets to "An Inconvenient Truth" to anyone who buys a new car. "Simply a car, a tree and a bike don't add up to zero . . . but at least it's moving in the right direction," Beyer said. Of course the deal is good on an SUV too and not everyone is impressed. Christopher C. Horner, senior fellow and counsel to the Cooler Heads Coalition of the Competitive Enterprise Institute, says: "If only we all drove Volvos, apparently. Somehow, I don't think Don Beyer has seen the movie." 8. Britain is in the middle of a cycling boom. The growth has been led by London, where the July 7 bomb attacks generated a 20 per cent increase in cycling as commuters abandoned the Tube. That "spike" has turned out to be a temporary blip, with most returning to public transport. But it has been replaced by a steady growth after investment in cycling increased from £5.5m in 2000 to £24m in 2006-07. The projected budget for 2009-2010 is £30m, by which time there will be 560 miles of dedicated cycle paths across the capital, compared to 310 miles currently. 9. The Lincoln Memorial traffic project that has created so many detours for cyclists is almost complete. Once $5 million in improvements to the grounds are complete, park service officials say, it will be easier for people to get to the memorial on foot or by bicycle or bus. He was seriously injured May 26 when he was struck by an automobile while riding his bicycle near the Goddard center's campus in Greenbelt. He died one day before his 58th birthday. The American Meteorological Society selected Dr. Kaufman to receive its prestigious Verner E. Suomi Award for achievement in atmospheric sciences days before his fatal accident. He did not learn of the award before his death. Ten for Tuesday - Your obsession with cycling borders on the interesting. 1. I just recently watched this from May 5th because my tivo is a little backed up. 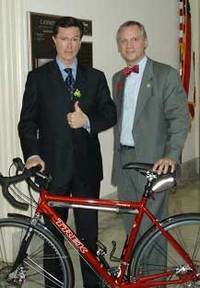 Well known bicycle enthusiast Rep. Earl Blumenauer was on the Colbert Report and he placed his bike in the background of the shot. In the photo at the left, Colbert sports a bicycle lapel pin. 2. I can tell from the comments posted here that some of you know your way around Lexus and Westlaw better than me. So when can DC count on a site like this? 3. Mainstream media coverage of the planning board's recommendation on the Met Branch Trail. ‘If it’s only about the money, then you’ve got to fight for the money,” [Commissioner Meredith K. Wellington] said. 4. Bicycling magazine gave out bikes in Baltimore as part of bike town. As a Bike Town alumnus myself (I got a free bike last year in DC) I think it's a great program. I saw two people at BTWD on their bikes from last year. Courtney Matthews, a Bicycling spokeswoman, said the magazine has kept in touch with past recipients of free two-wheelers and 86 percent respond they are happier three months after they started riding again. 5. The Post had a good run down of Montgomery County bicycling. Other projects include the Matthew Henson Trail, which would run through Aspen Hill, past Connecticut Avenue and Georgia Avenue, all the way past Layhill Road. The North Bethesda Trolley Trail, which runs along the old trolley tracks between Old Georgetown Road and Rockville Pike, is to be extended north to the Twinbrook Metro stop and south to the National Institutes of Health campus. 6. Another "Gas gets people out of their cars" story. "People are starting to look for fundamentally different ways to travel," said Bill Wilkinson, executive director of the National Center for Bicycling and Walking in Bethesda, Md. The soaring price of fuel "prompts people to really think about where they live and how they get around." 7. The Fairfax County Board of Supervisors endorsed Transaction 2030. On the top of the list are transit projects and pedestrian and bike travel. An estimated $16.6 billion would be needed over the next 25 years to fund the projects. The plan features more Metrorail stations and light rail or rapid bus service in some high-traffic corridors, including Route 7, Route 28 and Columbia Pike. It also includes about 600 miles of new trails and an 8-percent increase in highway capacity. 8. Bike to Work Day was a success in Baltimore and Washington. Chapman brought along Terri Broemm, a nursing teacher at Harford Tech who was riding to work for the first time and was nervous about the limited space for cyclists on the shoulders of some commuter routes. Although some noted that the crowd lacked diversity. 9. For those looking for a bike vacation, a new rail trail opens in West Virginia. It's called the Cranberry Tri-Rivers Rail-Trail, and Richwood city officials believe the 16.5-mile path will cement their town's growing reputation as a recreation destination. 10. Registration is open for the Indian Head 100 on Saturday, September 10, 2006. Cycle through scenic and historic Southern Maryland. Relax at a rest stop at the Mattawoman Creek Art Center. See bald eagles and blue herons as you pedal through hundreds of acres of gently rolling forested hills and tidal bottomlands to the panoramic vista of the Potomac River at Riverside. Enjoy a rest stop high above the Port Tobacco River with a spectacular view of the Potomac and Port Tobacco rivers. 1. This is awkward. So remember when I said that DC's portion of the Met Branch was under construction? And remember how I had photos and everything? It turns out I was wrong. It seems there's still some legal wrangling over land swaps and property rights - and from what I hear there is no real end in sight. I think DDOT is hoping to finish the next section in spring of 2007. 2. The CCT may need to be closed for a while. I mentioned that there was some damage on the CCT from where water, flowing down the streets in the Palisades neighborhood, overwhelms the drainage going under the trail and so instead flows over it and erodes the rail bed. (see poorly taken photos). Well, the National Park Service said that even if DC came up with the money ($140K), which they probably can, they may not have the manpower to manage the project. If they did, they might have to close a section of the trail between the "secret" Norton Street access and the Arizona Ave Bridge, for as long as 6 months (Though it's possible a temporary detour could be put in place). The trail needs to be repaired in two places and could wash away in as little as 3 years under normal weather - sooner with a hurricane. If they do do the work, they might build a staircase down to chain bridge too. 3. Sierra Club activist reviews the Montgomery County "in the 21st" century plan. The urbanized centers would benefit not just their inhabitants, but also the people who live in the traditional suburban neighborhoods around them. We would be able to access many of our needs by foot or bicycle. More of us would have access to good public transport. Children could walk to school again! 5. 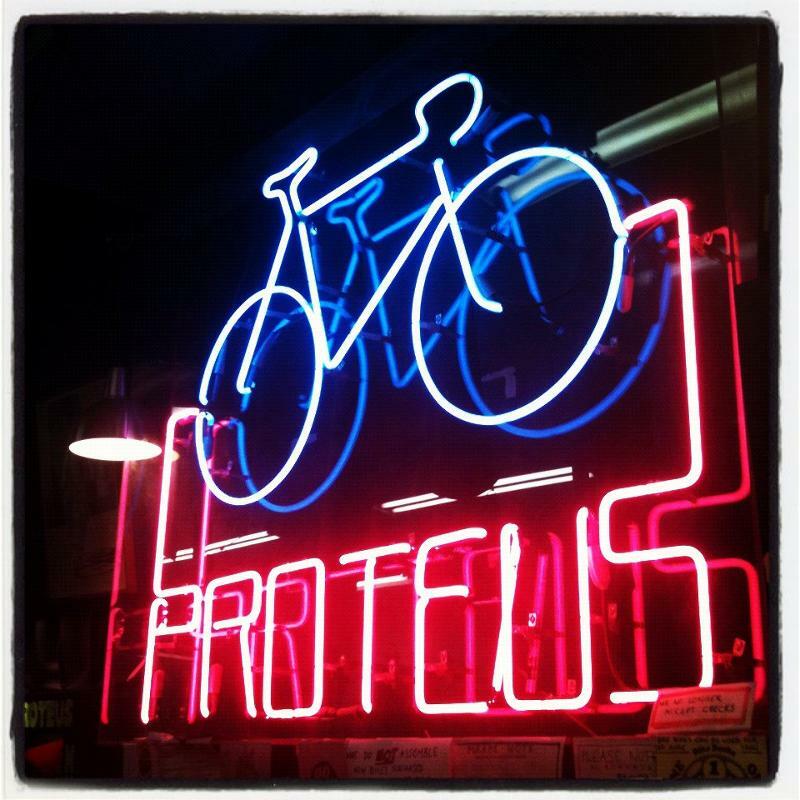 The CSC Clarendon Bike Race is June 3rd. The CSC Invitational, the region's premier professional bike race, is in its 9th year. This exciting event offers race fans a great opportunity to see the world's best cyclists compete on a very spectator friendly course 1 km in length, located at the Clarendon Metro stop in Arlington, VA. The 100 lap Men's Pro race begins at noon. 6. If we can celebrate MLK's birthday in April then we can celebrate the opening of the XCT twice. The trail stitches together a series of existing trails in the 399-square-mile county, allowing bikers, walkers and joggers to traverse Fairfax from the Occoquan River in the south to the Potomac River in the north, crossing the greenways of Difficult Run, Accotink Creek and Pohick Creek. Although some segments of the trail run along busy roads, long stretches of it are in surprisingly secluded stream valleys and woods. 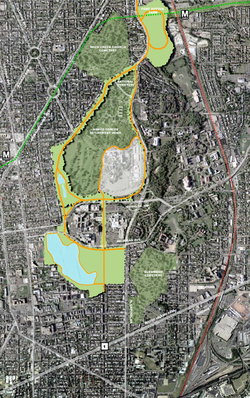 Despite the heavy development of recent decades, Fairfax still has 23,000 acres of parkland. 7. More about Bike Month. 8.The Outside Line writes about biking and upcoming rides. So I found myself last weekend in western Montgomery County, wending through the back roads around Poolesville, cruising by farms and fields, with no more company than the occasional horse I'd pass in a pasture. 9. Here's a good article in the Gazette about trail biking - something I'd like to do more of. The Oxon Hill club holds rides twice a week during the summer and once a week during the winter. In fact, there’s only one time of year they truly stop — hunting season. ‘‘Hunters and mountain bikers do not mix,” Howard said. 10. The Georgetown Boathouse Environment Assessment is out. Comment period lasts until June 15th. The boathouse would be build at the southern trailhead of the CCT. The start of the Capital Crescent Trail, at K Street, will be constricted by a construction and maintenance access road; bikers, hikers, and baby strollers will tangle with heavy equipment. Along the CCT, visitors would be directly affected by construction of the boathouse because of its proximity to the trail. Once the boathouse is constructed, views from the CCT will be obstructed when biking or walking along the trail adjacent to the new building. While a similar condition exists as the CCT passes the WCC, under Alternatives A,B or C visitors would experience a two story building in an area where they currently experience a natural environment. Further, while visitor use of the trail would continue similar to existing conditions, there would be occasional periods when movement is restricted due to a trailer, or service vehicle, turning into or out of the turnaround area. I mentioned earlier that construction on the Metropolitan Branch Trail north of the New York Avenue Metro station had begun and the other day I got out and took some photos of the construction. In addition to work north, I noticed that asphault has been put down south of the station all the way to L St NE, where it runs behind the parking lot across from the bus station (it's possible this work was done a long time ago, but I never remember seeing it before). Eventually a staircase and/or a ramp will connect this part of the trail - at the level of the railroad tracks - with L Street about 11 feet below. I must warn you that I'm not much of a photographer. 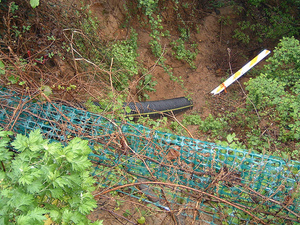 The first photo is of the portion that was opened (and promptly closed) in December 2004. The next shot is of the construction looking north from the New York Avenue Bridge. The green line I drew in constitutes the west edge of the trail. The last photo is of the trail south of the station.